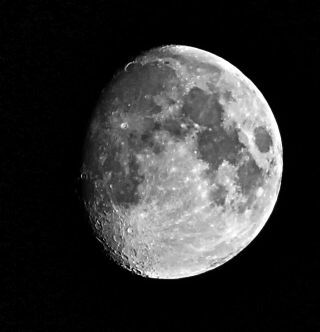 Night sky observer Thomas Cooper snapped this amazing view of the moon and its craters on Aug. 27, 2012. The moon is Earth's nearest cosmic neighbor, but it is more than just a big pretty light in the sky. Here are 10 cool, and sometimes surprising, facts about Earth's nearest neighbor: the moon. Japan's National Institute of Advanced Industrial Science and Technology. Perhaps the coolest thing about the moon is that it always shows us the same face. Since both the Earth and moon are rotating and orbiting, how can this be? Long ago, the Earth's gravitational effects slowed the moon's rotation about its axis. Once the moon's rotation slowed enough to match its orbital period (the time it takes the moon to go around Earth) the effect stabilized. Many of the moons around other planets behave similarly. As the moon swings around on its orbit, a thin sliver of reflected sunlight is seen on Earth as a crescent moon. Once the Moon is opposite the Sun, it becomes fully lit from our view — a full moon. More than 400 trees on Earth came from the moon. Well, okay: They came from lunar orbit. Okay, the truth: In 1971, Apollo 14 astronaut Stuart Roosa took a bunch of seeds with him and, while Alan Shepard and Edgar Mitchell were busy sauntering around on the surface, Roosa guarded his seeds. Later, the seeds were germinated on Earth, planted at various sites around the country, and came to be called the moon trees. Most of them are doing just fine. NEXT: More Than One Moon? The moon is Earth's only natural satellite. Right? Maybe not. In 1999, scientists found that a 3-mile- (5-kilometer-) wide asteroid may be caught in Earth's gravitational grip, thereby becoming a satellite of our planet. Cruithne, as it is called, takes 770 years to complete a horseshoe-shaped orbit around Earth, the scientists say, and it will remain in a suspended state around Earth for at least 5,000 years. The moon's heavily cratered surface is the result of intense pummeling by space rocks between 4.1 billion and 3.8 billion years ago. The scars of this war, seen as craters, have not eroded much for two main reasons: The moon is not geologically very active, so earthquakes, volcanoes and mountain-building don't destroy the landscape as they do on Earth; and with virtually no atmosphere there is no wind or rain, so very little surface erosion occurs. The moon is not round (or spherical). Instead, it's shaped like an egg. If you go outside and look up, one of the small ends is pointing right at you. And the moon's center of mass is not at the geometric center of the satellite; it's about 1.2 miles (2 kilometers) off-center. Apollo astronauts used seismometers during their visits to the moon and discovered that the gray orb isn't a totally dead place, geologically speaking. Small moonquakes, originating several miles (kilometers) below the surface, are thought to be caused by the gravitational pull of Earth. Sometimes tiny fractures appear at the surface, and gas escapes. NEXT: Is the Moon a Planet? At full moon and new moon, the Sun, Earth and moon are lined up, producing the higher than normal tides (called spring tides, for the way they spring up). When the moon is at first or last quarter, smallerneap tides form. The Moon's 29.5-day orbit around Earth is not quite circular. When the moon is closest to Earth (called its perigee), spring tides are even higher, and they're called perigean spring tides. As you read this, the moon is moving away from us. Each year, the moon steals some of Earth's rotational energy, and uses it to propel itself about 3.8 centimeters higher in its orbit. Researchers say that when it formed, the moon was about 14,000 miles (22,530 kilometers) from Earth. It's now an average of 239,000 miles, or 385,000 kilometers away.